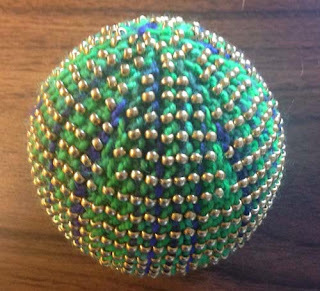 In yesteday's post I mentioned the talented Jackie E-S. One of her whimsical designs caught my eye, the Stress Ball. What really moved me from 'liking' to 'wanting to make' was when it morphed into a Mardi Gras Ball. I couldn't resist and decided that I would make one a year, each different but sticking with the Mardi Gras theme. I had the same yarn that Jackie used but that will wait for next year's ball. 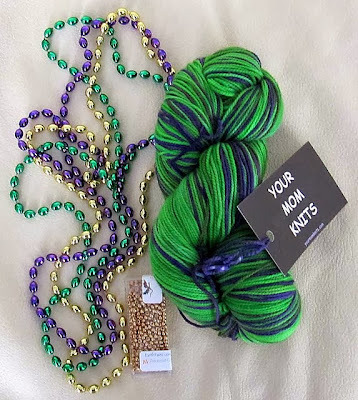 For this year, I found another yarn that called to me. I will be making my Mardi Gras ball soon, but the first one went to Jackie. Note: The pattern calls for the ball to be stuffed but I decided to put a styrofoam ball inside this one, and all future balls. There are other variations for beading patterns on the HeartStrings site, here, and click here for the Ravelry link. On the Knitting Enjoyment Scale, I give this project a 10! I heard you were making a voyage into your Stash. I hope all turns out well please be careful and take some water and food.. Be sure and take your phone so you can call for help if you can't find your way back out. At least I won't be cold!